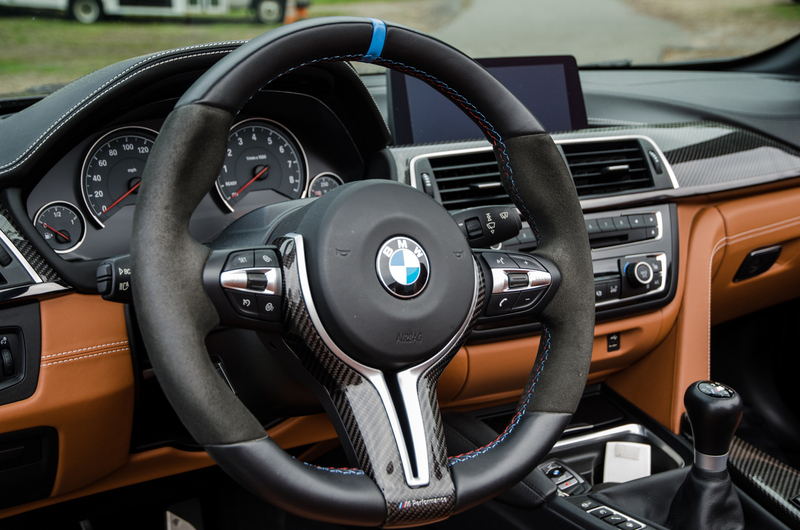 A few months back, I attended what BMW called its “Test Fest”, which is where journalists were given the chance to drive several different cars in the same day. The difference between this event and a normal one, which would offer a similar opportunity, is that this was a bit of a free-for-all. 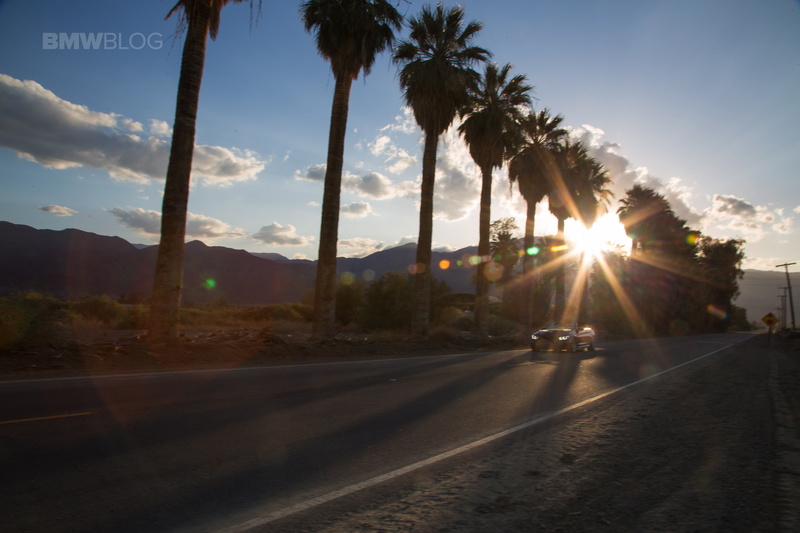 So the cars were lineup up next to the track, at the gorgeous Thermal Club in Palm Springs, California, and the keys were in them. The journalists were free to grab whichever one they wanted, however many times they wanted, and go. 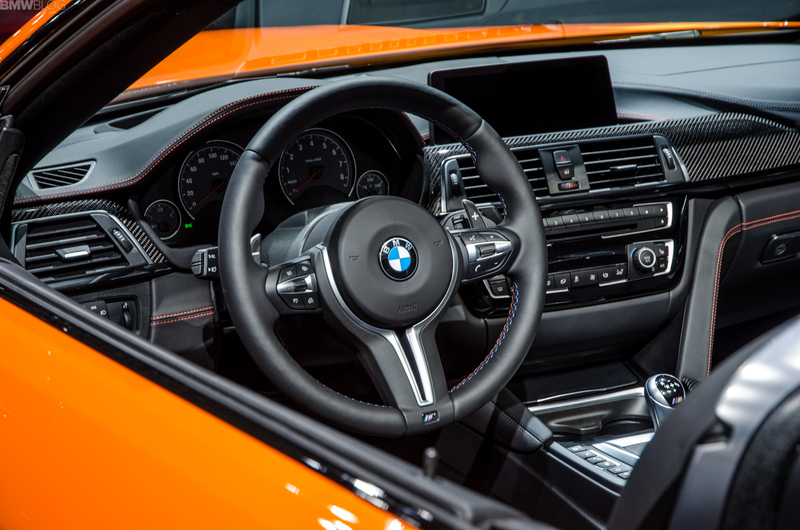 Of the cars on hand, there was the new BMW M5, the BMW X2, 6 Series GT and one other car that caught my eye, as well as the eyes of several other motorists — a BMW M4 Convertible. 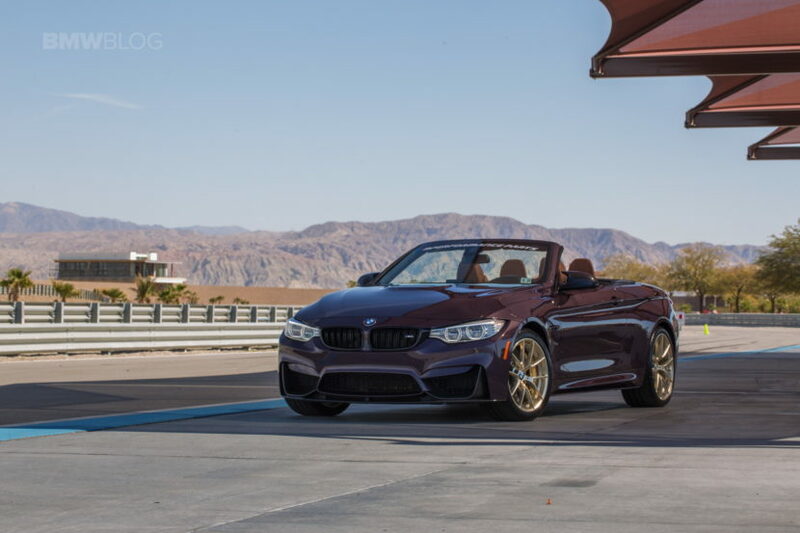 This wasn’t just any BMW M4 Convertible, though. 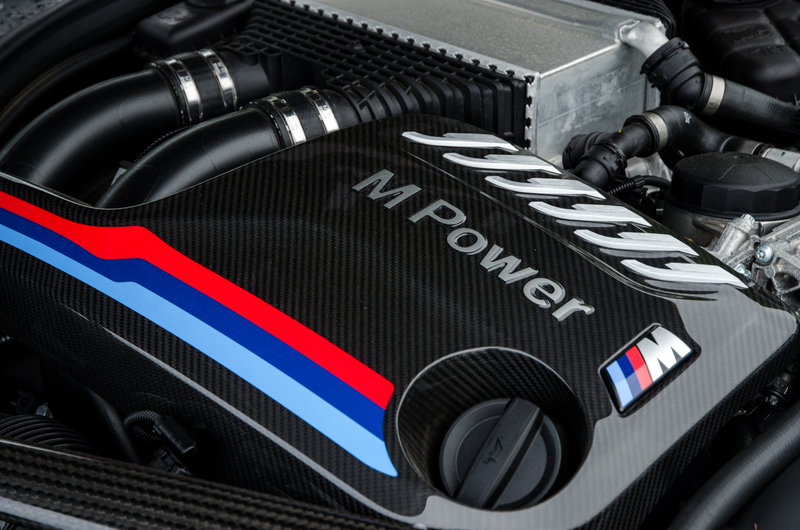 We’ve seen countless M4 ‘Verts over the years, so a standard one would have been white noise. 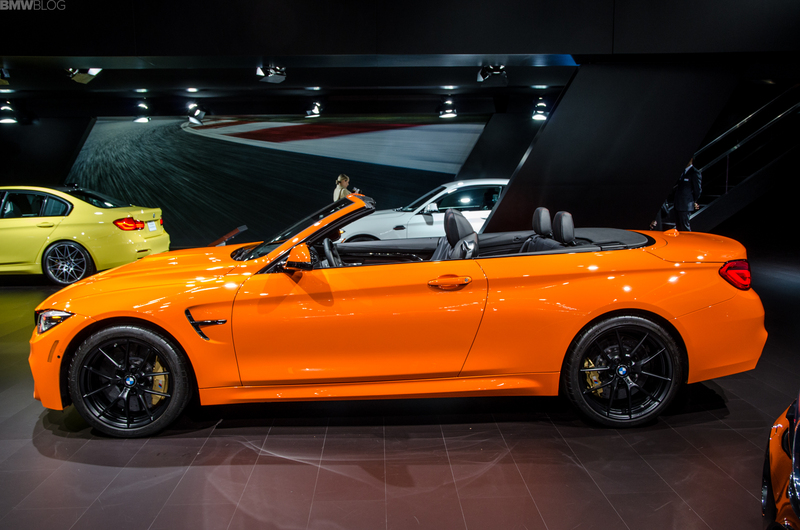 This one, though, was a configured by our friends at M Performance, so it looked great. 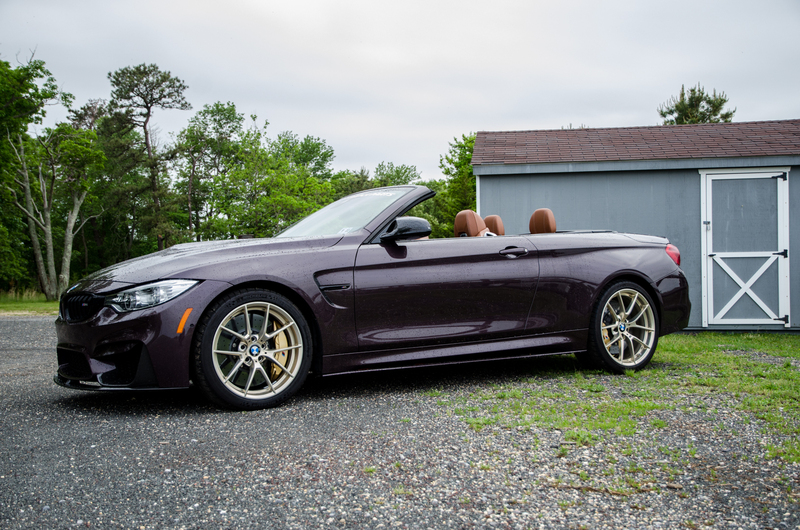 It was painted in Tourmaline Violet Metallic, an Individual color that’s a bit similar to the Daytona Violet we’ve seen on many other M cars. 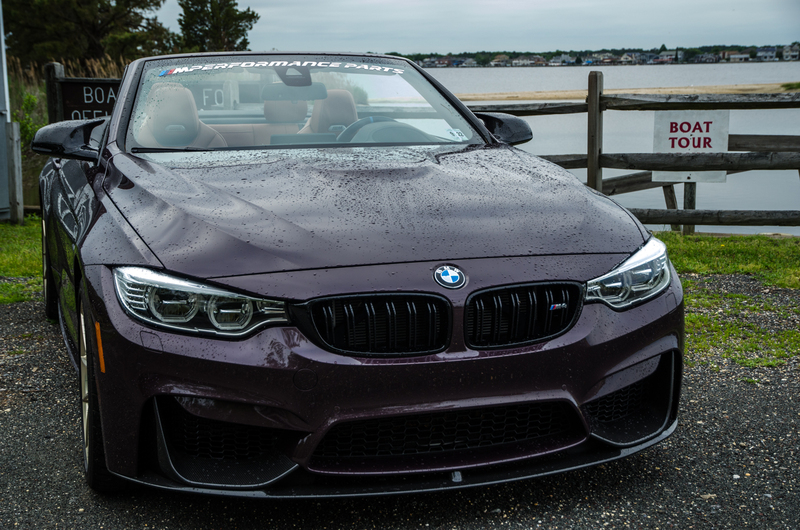 It’s not as good looking as the E36 M3’s classic Techno Violet, but it’s always cool to see a purple BMW. 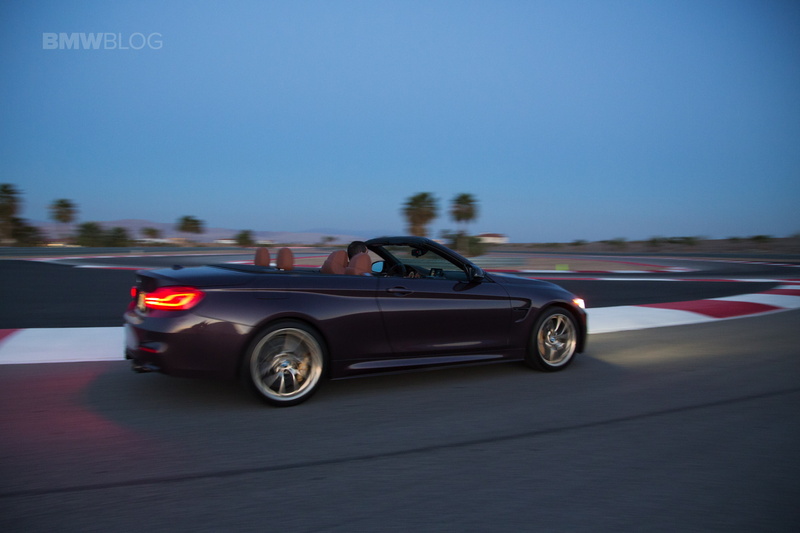 Sitting in the California desert sun with its top down, the purple M4 showed off its brownish leather interior and, the real eye-catcher, its six-speed manual transmission. 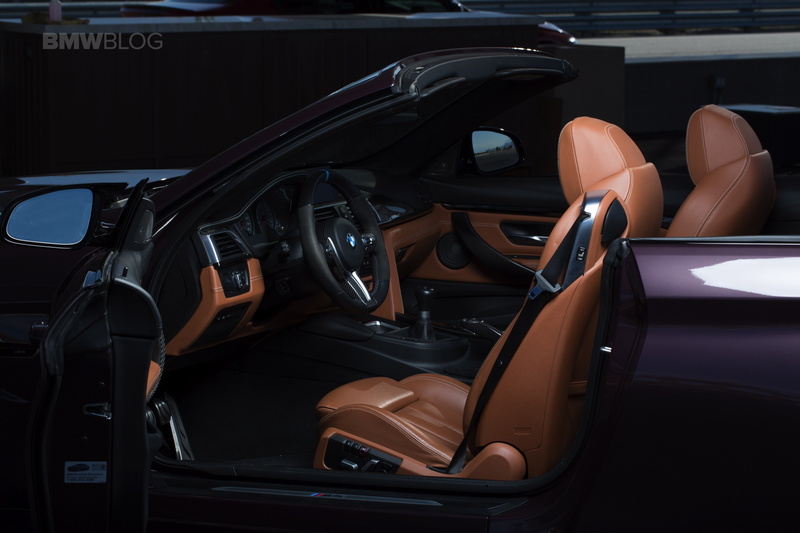 Just the color scheme and six-speed stick in between the seats were enough to attract enthusiasts. 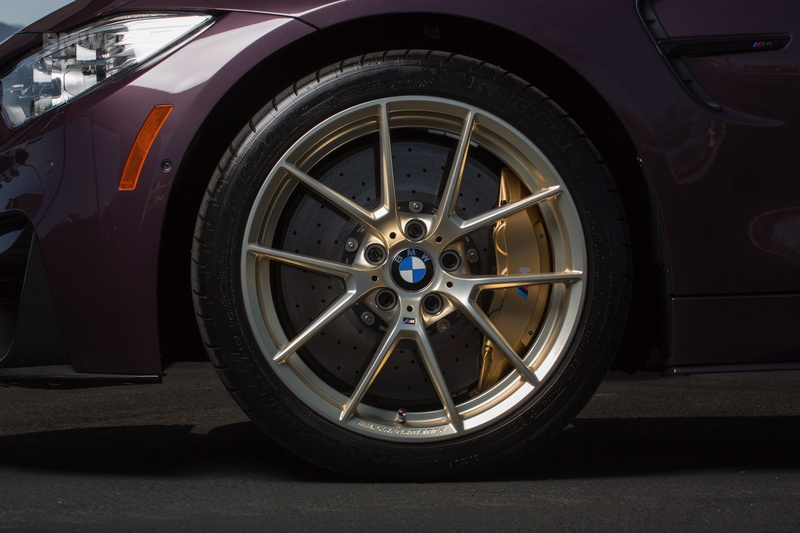 However, there were also some carbon fiber goodies, gold Style 763M wheels, a lowered M Performance suspension and an M Performance exhaust. So, needless to say, there was a bit of a line of folks who wanted to drive it. That day, the M5 and X2 were my primary concerns, so I left my desire to drive the M4 ‘Vert behind. 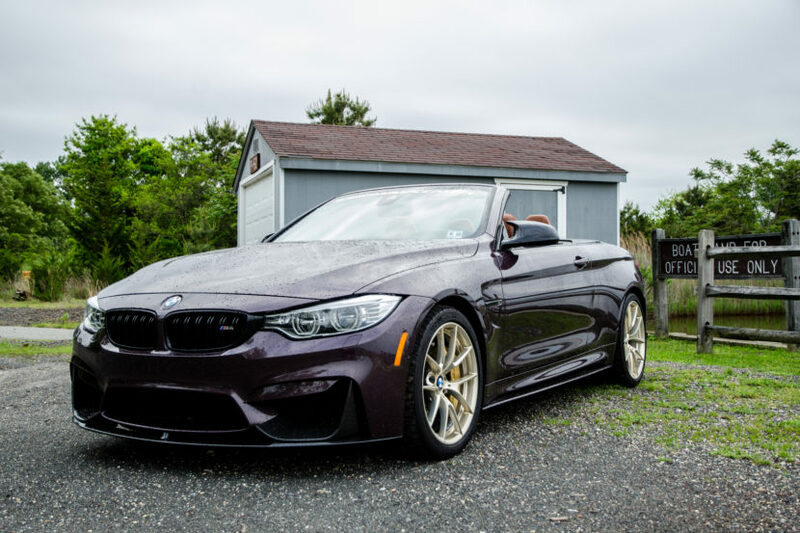 Plus, I’d already driven M4s before, so I wasn’t going to waste time driving it, time that could have been in newer, more important cars. 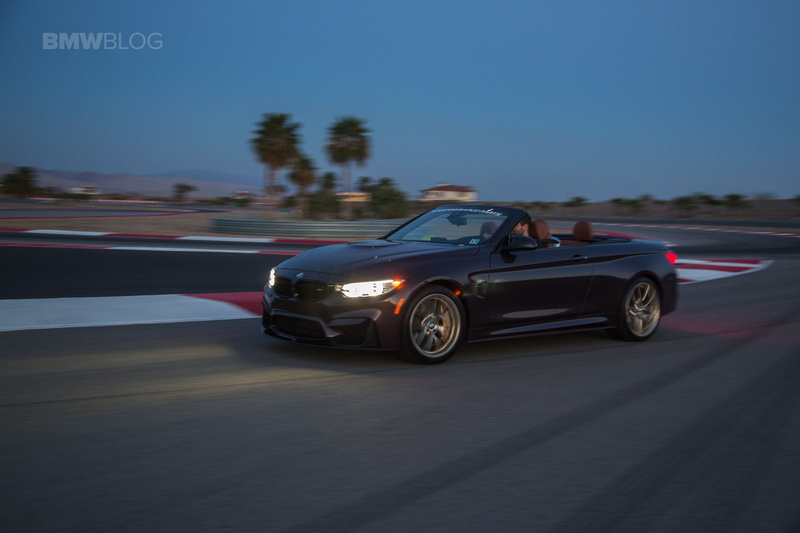 However, I still wanted to drive it and I even told one of the people from M Performance that my plan was to drive everything I needed to drive and then take the M4 up through the desert hills for just a bit of a joy-ride, some much-needed “Me Time”. 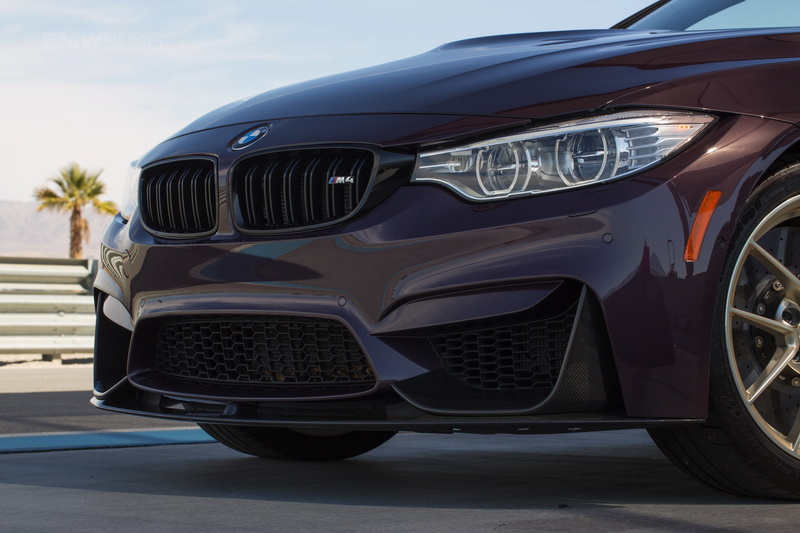 Unfortunately, that never happened, as it was never available when I was available and I never got to drive my purple M4. 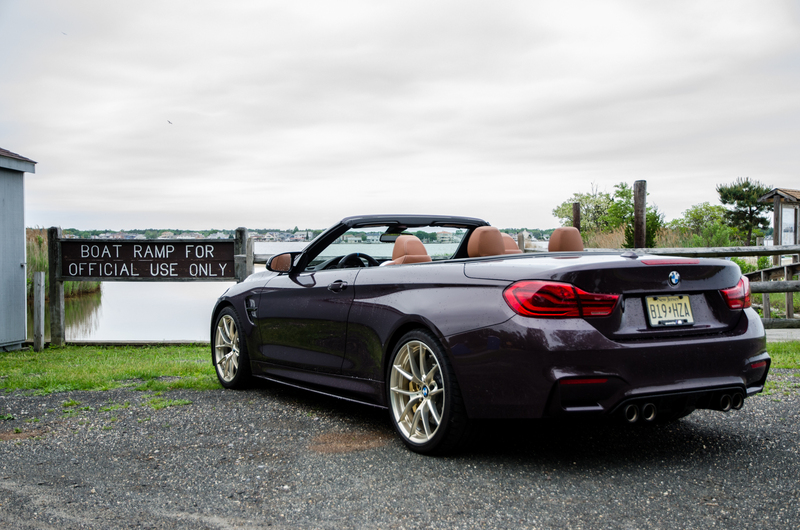 However, our friends at M Performance said I could borrow it when I got back to New Jersey. Many months later, of course, because Test Fest was in March and New Jersey was still doing its best Siberian winter impression. 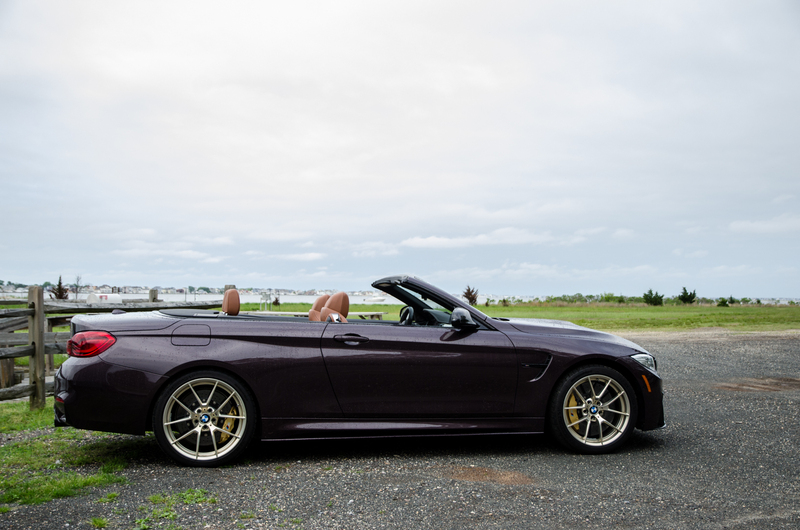 Fast forward a few months later and it was finally time to drive my purple M4. 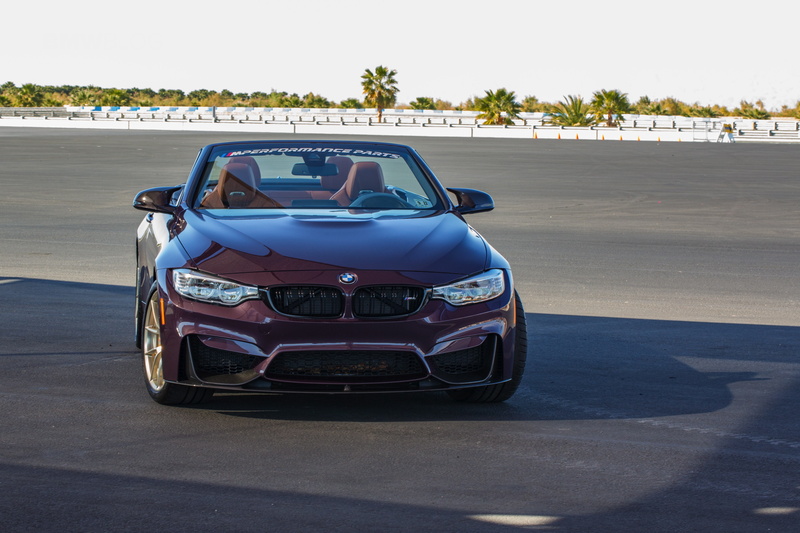 When I approached the M4, it was sitting outside of BMW M Performance’s HQ with its top down, ready to go. 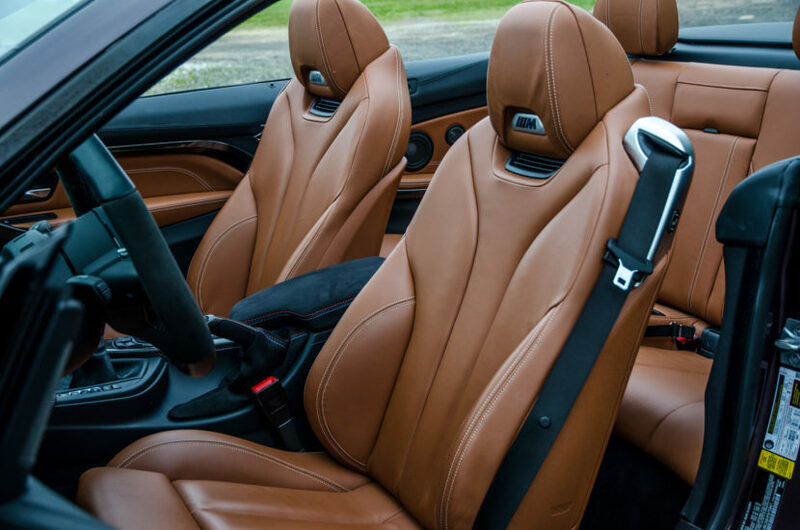 That was actually a bit of a problem because, holy hell, those seats get hot in the sun and shorts were a bad idea. Scorched thighs aside, though, I was ready to roll in a car that I’ve been waiting to drive for a long time. It looked fantastic, with the sunlight turning its subtle purple into a much more vibrant color. 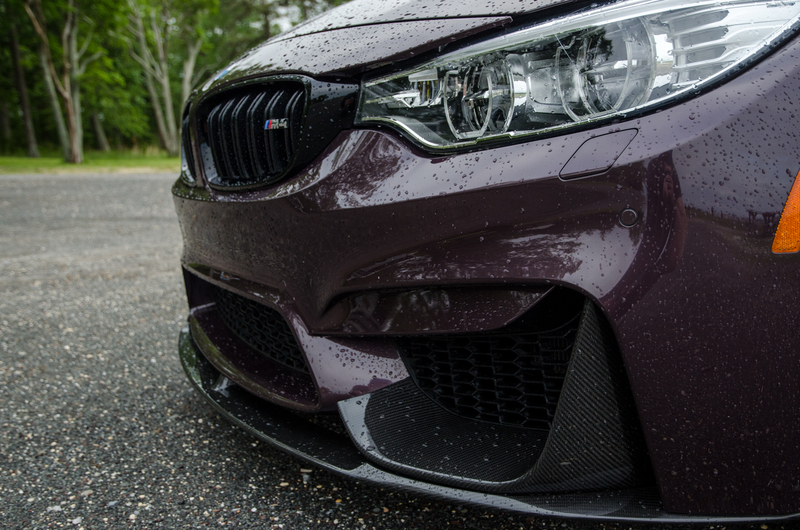 The carbon fiber mirrors, lower front lip and, more importantly, its gold wheels made it stand out even further. Though, this is where my pre-conceived notions of a love affair start to fade. I start then engine up and am met with a bark and a fart akin to a vacuum cleaner sucking up a sock full of rocks. 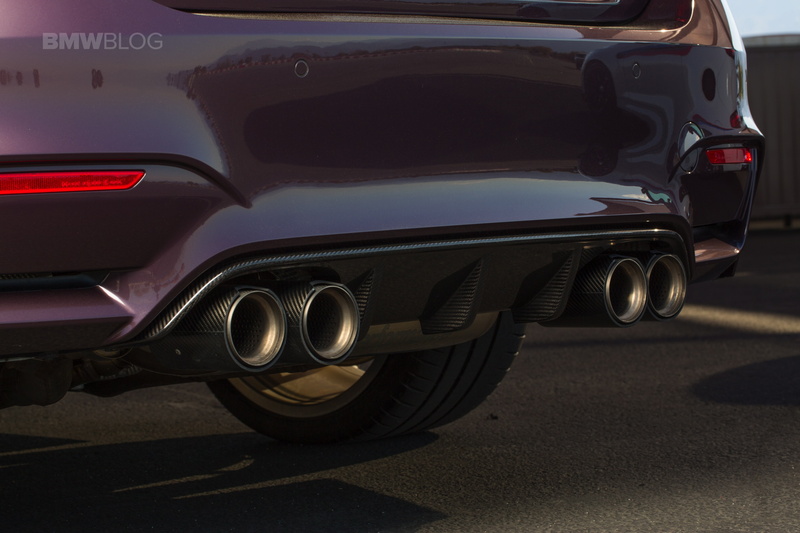 It’s angry and aggressive, sure, but there’s nothing pretty about it, nothing sonorous. 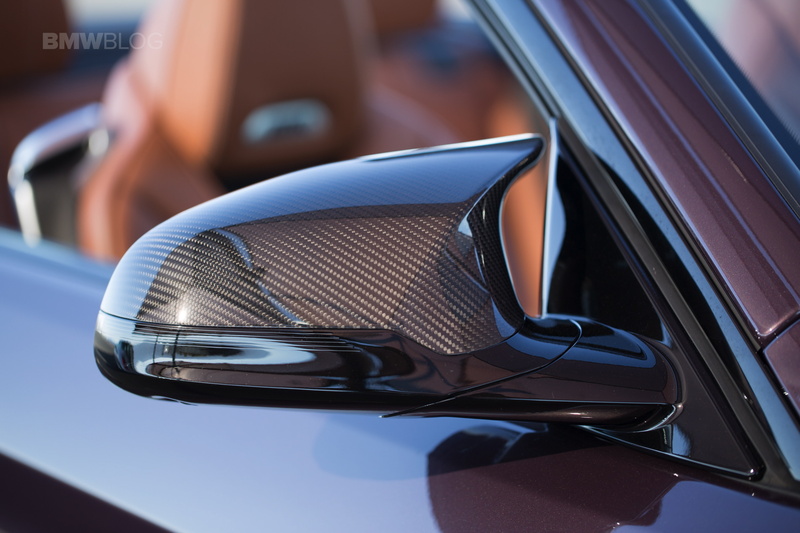 And its seductive good looks seriously belied the rather crude noise coming from its quad, carbon-tipped exhaust pipes. 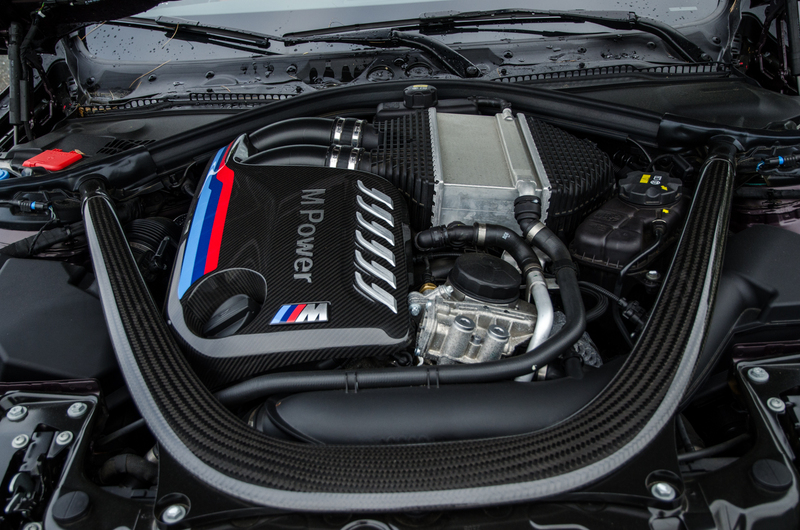 Most of the problem lies with the BMW M4 Convertible’s S55 engine, the same engine shared with every other M3/M4. 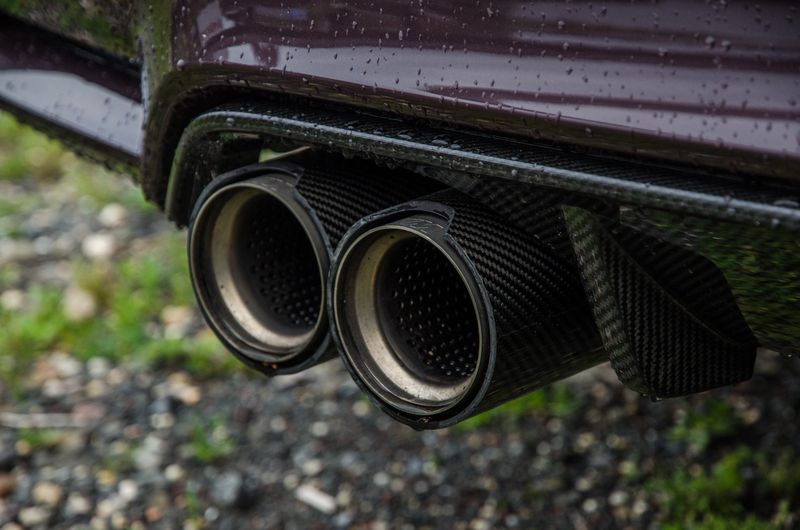 It just isn’t a good sounding engine and takes a lot of exhaust tuning to make it decent. 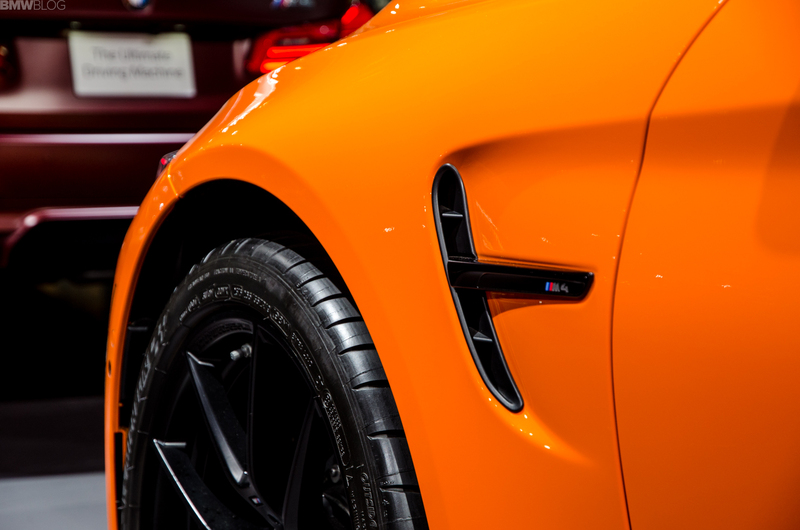 For instance, the M3/M4 CS really good. 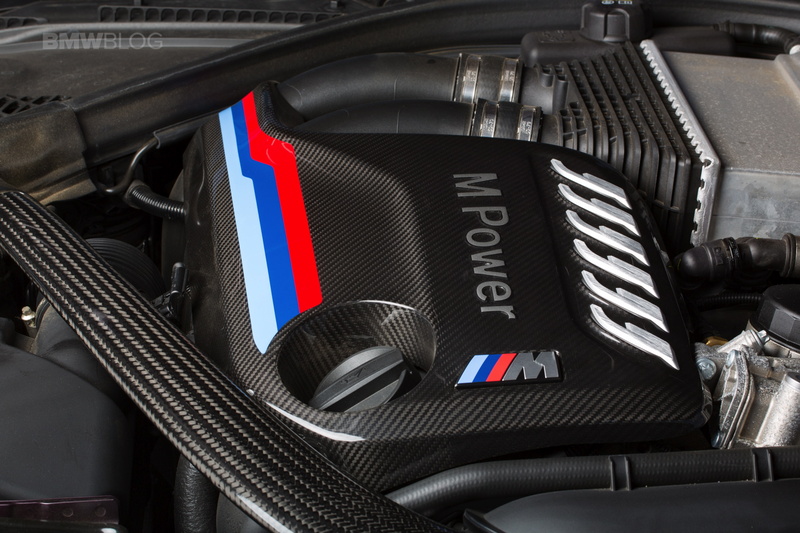 But the M4 Convertible with an M Performance exhaust does not. Still, though, I wasn’t going to let that rain on my parade. 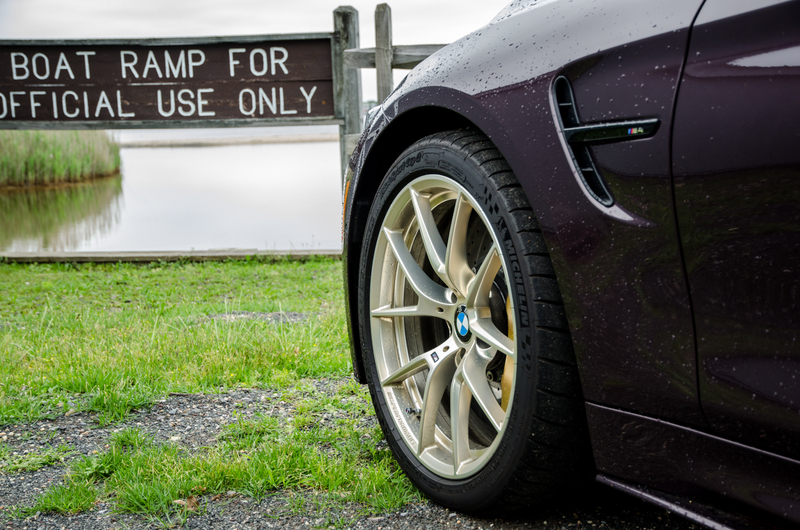 I had a six-speed manual, twin-turbocharged, rear-wheel drive, purple (!) 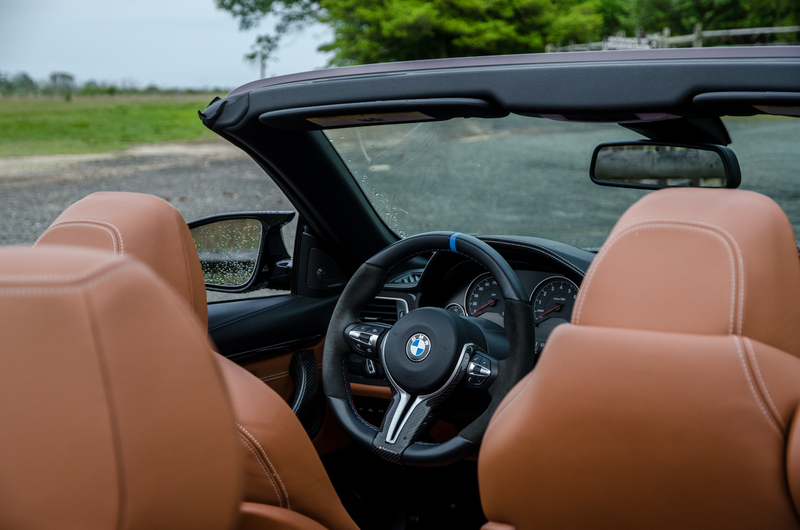 convertible for a week at the end of May, with sunny weather. It’s hard for that to not put a smile on your face. So off I went. 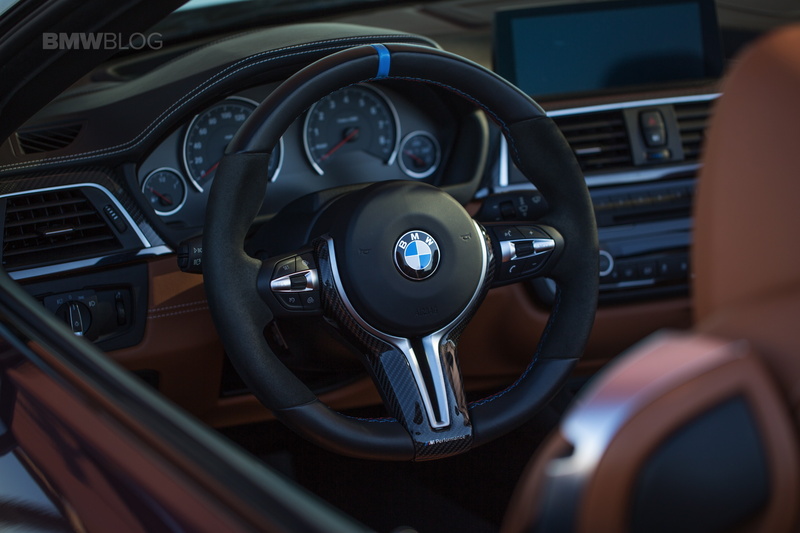 First gear, let off the clutch, take it easy until I’m out of BMW’s headquarters and then let all 425 horses play. Unfortunately, that’s where I encountered another issue. The suspension. 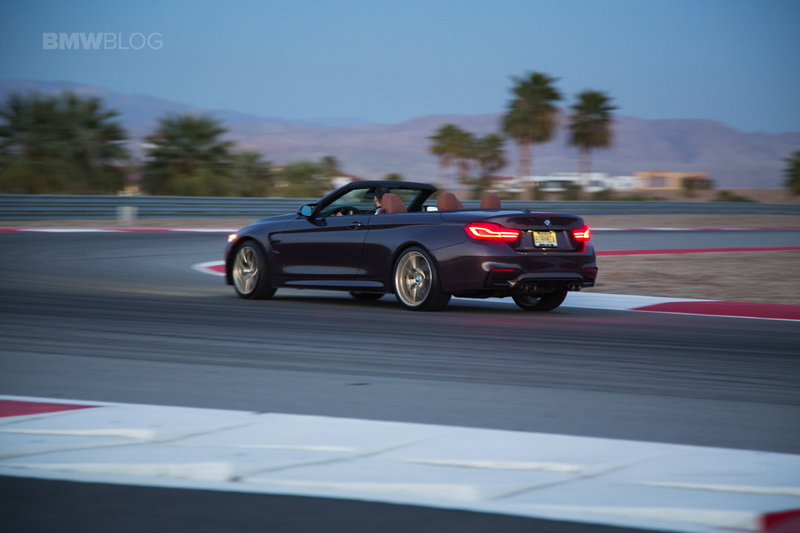 M Performance suspension is great when you’re on a track, which is mostly what my M4 was doing in Palm Springs. On the road, though? It’s far too stiff. Bone-shakingly so. 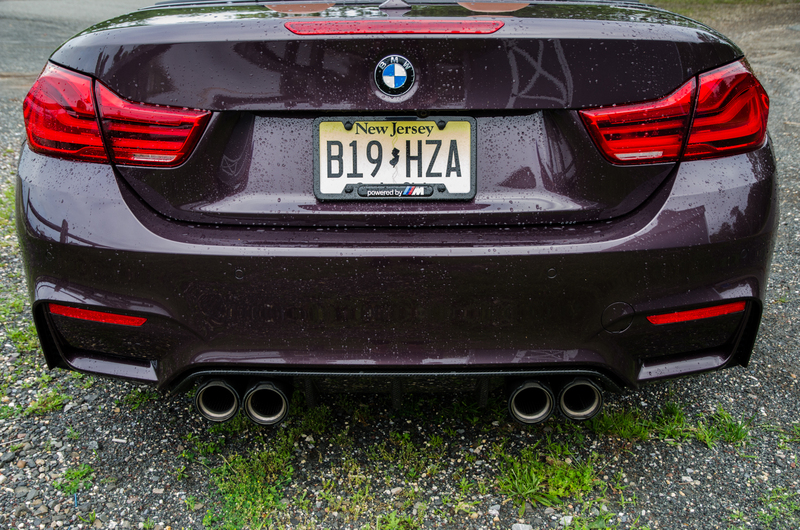 I think I’m a few centimeters shorter after having driven it over some of New Jersey’s famously blitzkrieged roads. 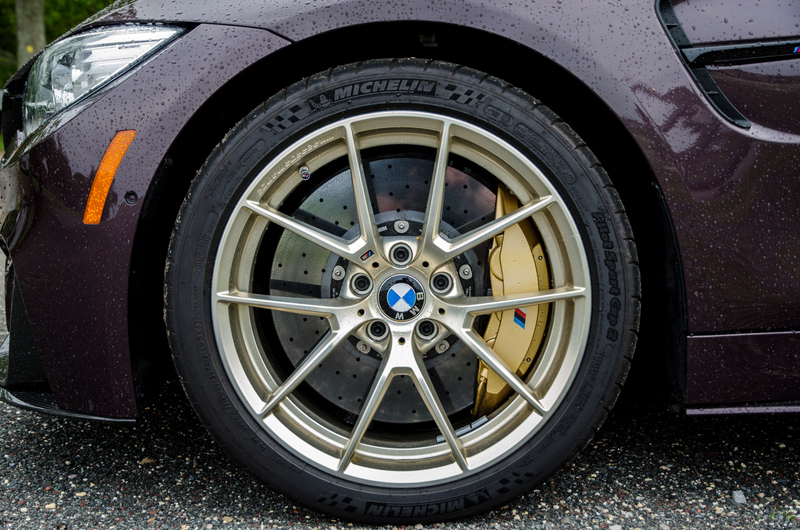 It’s as if the actual dampers are made of granite. On a track, this is great but not on the road. 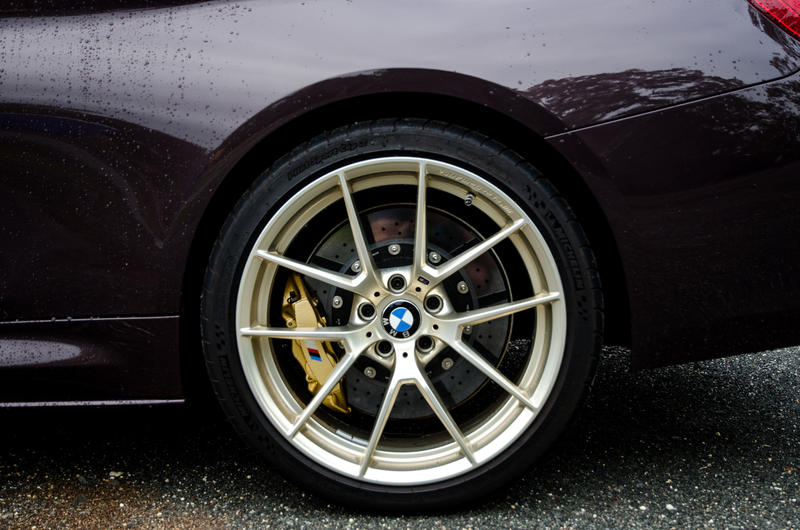 I would not recommend the lowered M suspension for a daily driver. 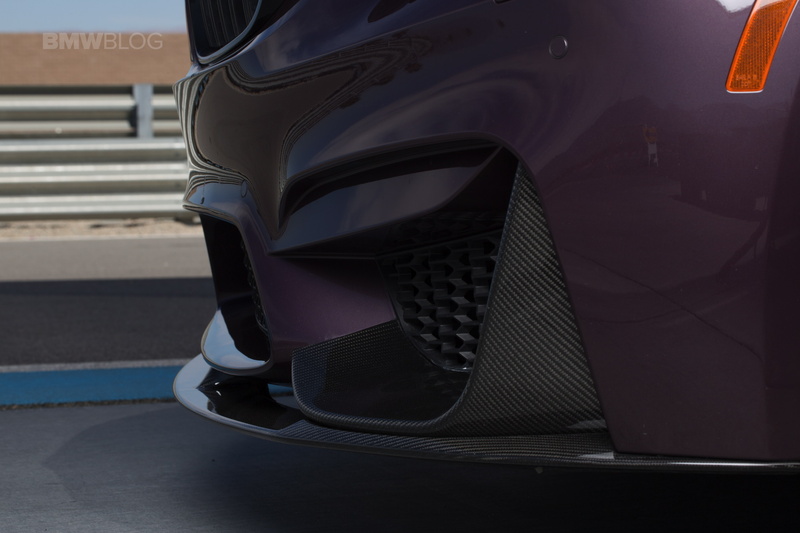 That overly stiff suspension also had another negative affect on the car, cowl shake. 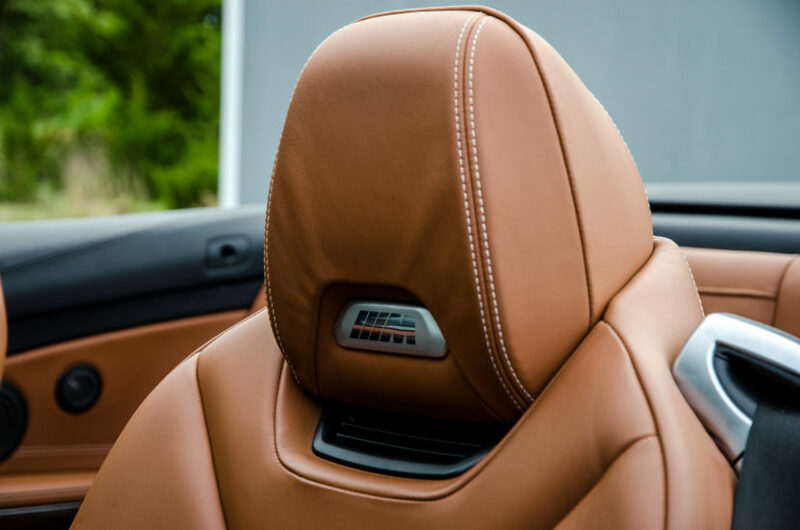 M4 Convertibles were never the stiffest of drop-tops, so they’ve always had a bit of cowl shake, thanks to the chassis being less rigid without a roof. 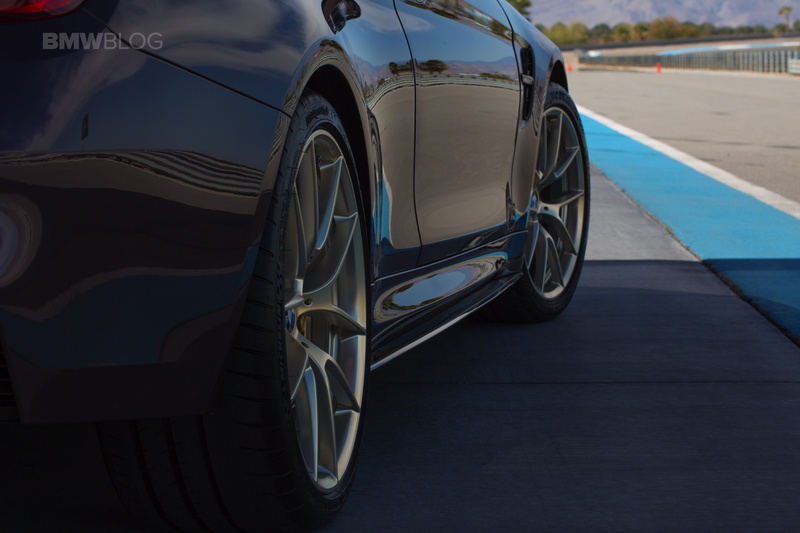 However, the brittle suspension exacerbated that effect and made the entire car feel as if it was being shaken apart. 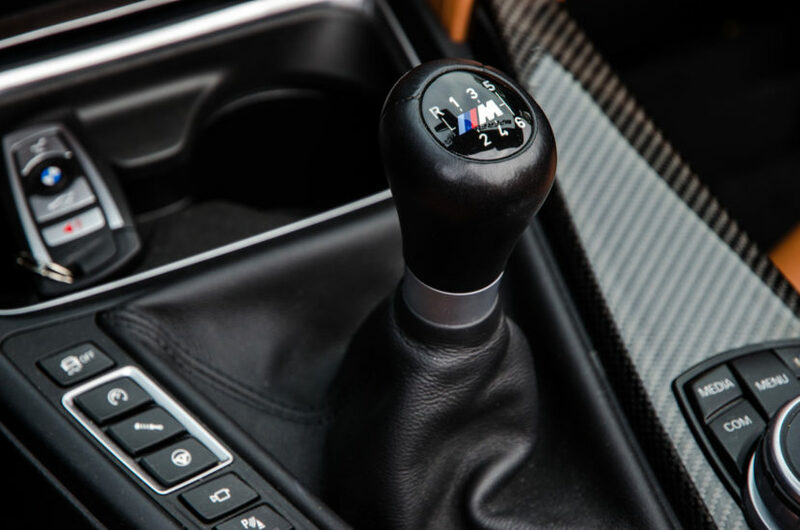 It was still an M4 Convertible with a six-speed manual, though. 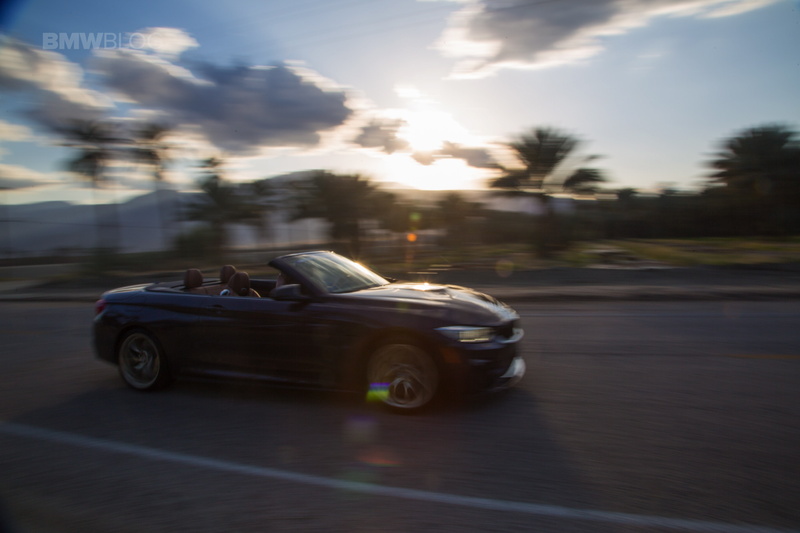 So it was fast, fun to drive and, at times, thrilling. 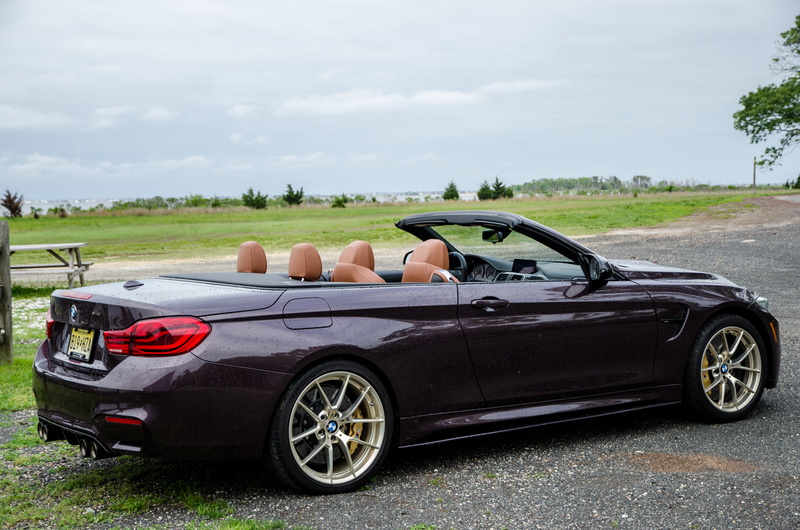 Sure, the standard M4 Convertible is a bit less dynamic than a lot of enthusiasts would like but it was still fun to unwind on a twisty bit of road and, smooth road permitting, was actually a great GT car. 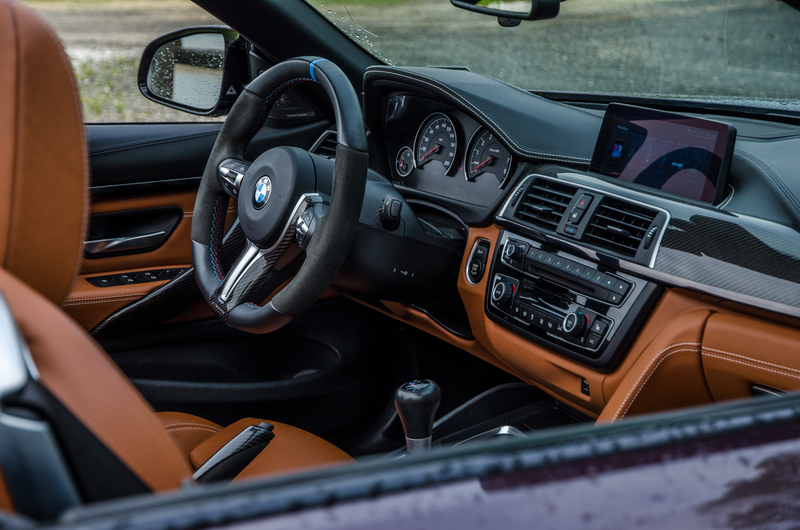 I don’t love BMW’s manuals, as they tend to be a bit rubbery and vague, with a springy clutch, but I was just happy to have three pedals and a row-my-own shifter. 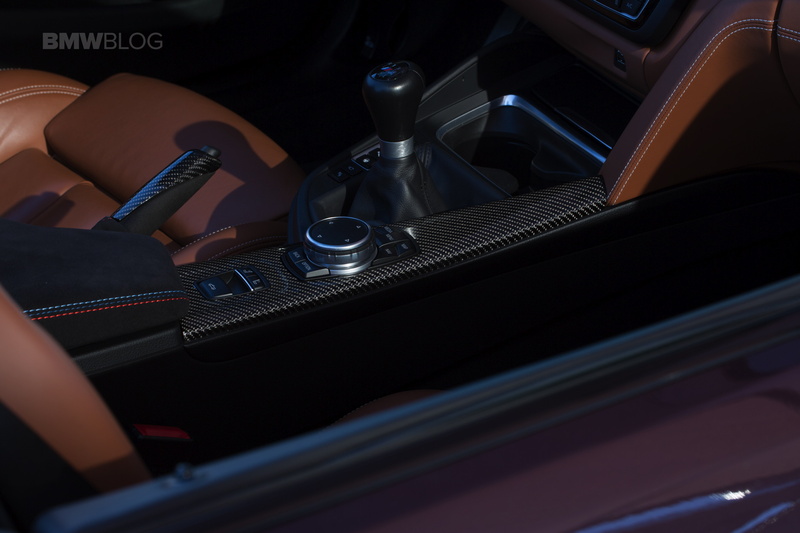 The M4’s manual will automatically rev-match and it’s a feature that can’t be turned off unless traction and stability control are both completely turned off, which is something I’m not comfortable doing in a car as tail-happy as the BMW M4. So it stayed on during my entire week with the car. Although, I don’t mind auto rev-matching, as it’s better than I am at it and it makes driving through traffic a lot easier. 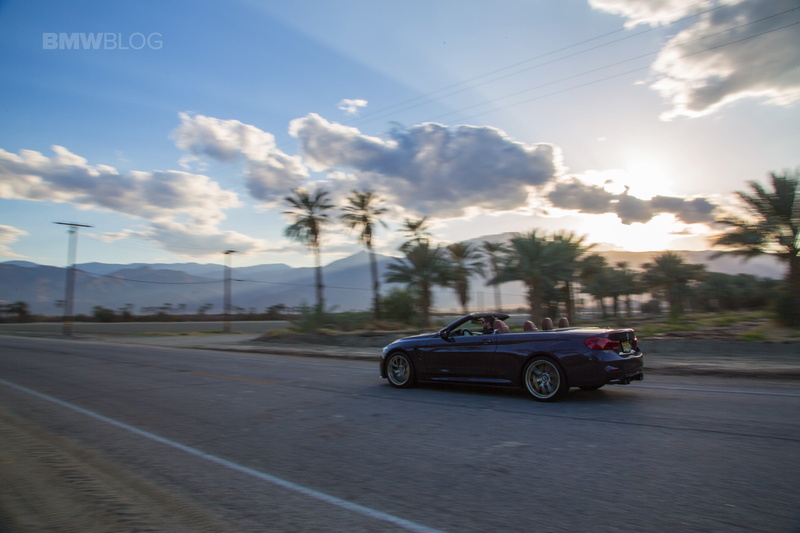 What was most interesting about my week with the M4 Convertible was just how old it felt, though. 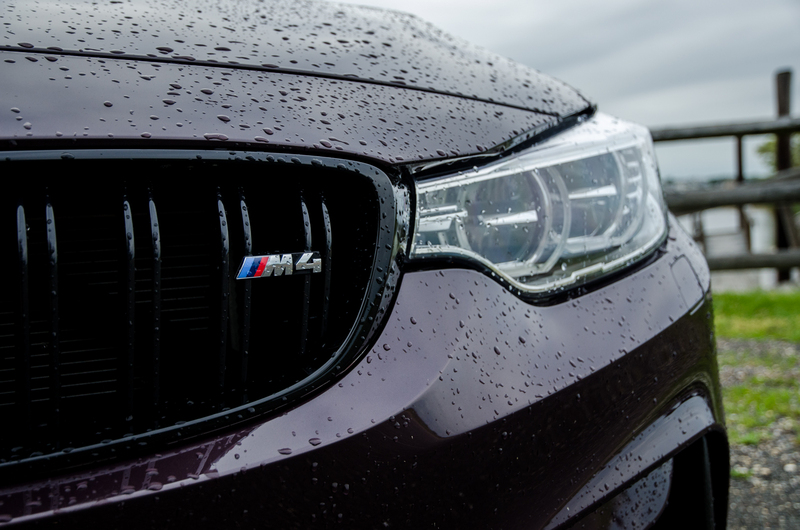 The M4 is not an old car, having debuted in 2014. 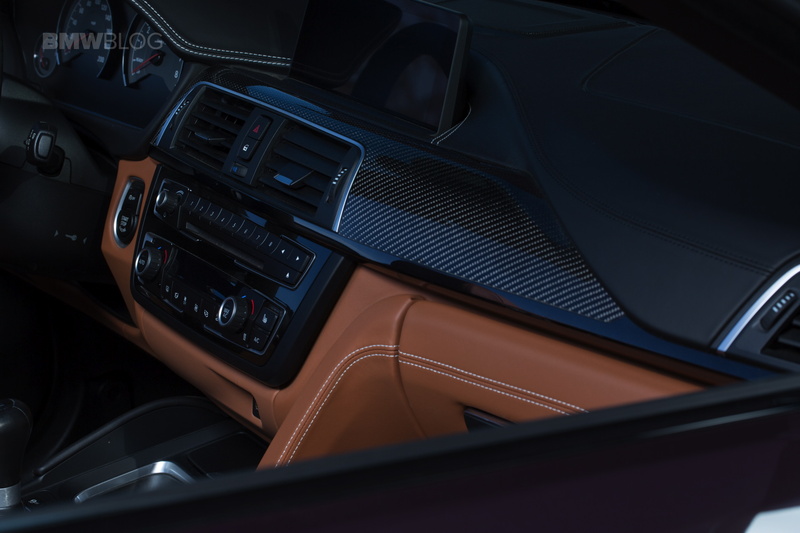 However, compared to BMW’s most recent models, such as the new X3 M40i and M5, it feels as if it’s from a different era entirely. 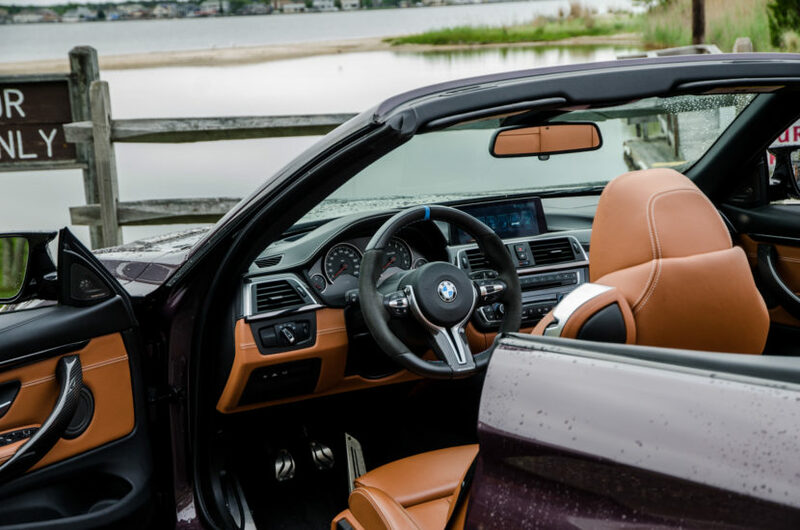 It’s still a fun car to drive but BMW’s newer cars are light-years ahead of it, in terms of both capability and driver engagement. Also, its folding metal roof seems like something that needs to go away. It’s too heavy, as you can feel the car shake back and forth as it does its power folding dance, and completely ruins trunk space. 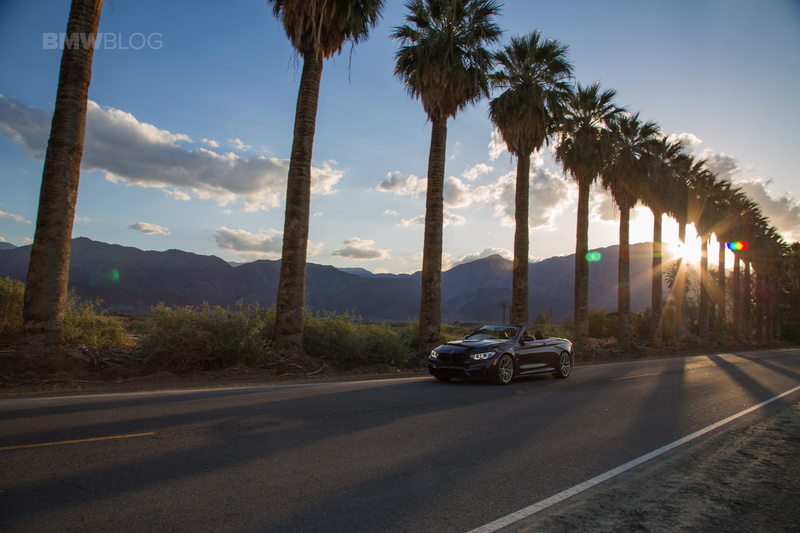 With the top down, I couldn’t fit my single backpack in the trunk, which made bringing camera equipment, my laptop and other gear a bit of a chore. 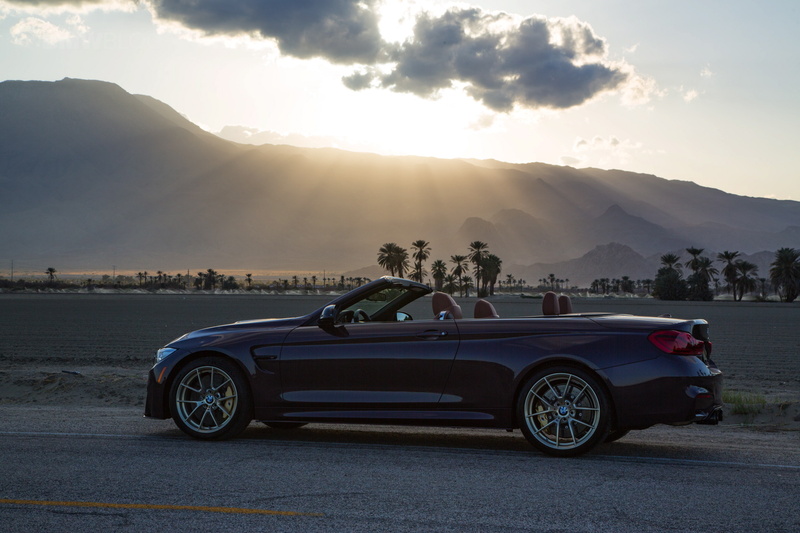 I know it sounds like I’m being harsh on the M4 Convertible but I’m being honest and objective. I’m sure in 2014, it was a revelation. 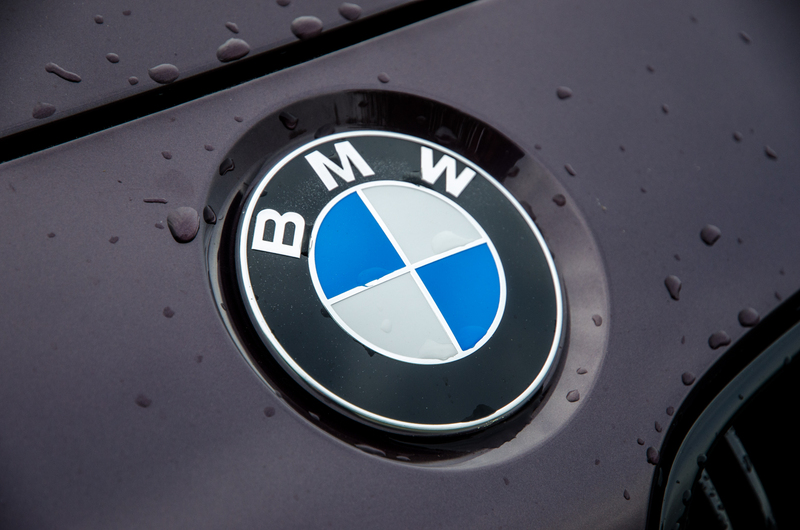 But the industry, and especially BMW itself, has moved on so far since its debut that it just doesn’t feel competitive anymore. 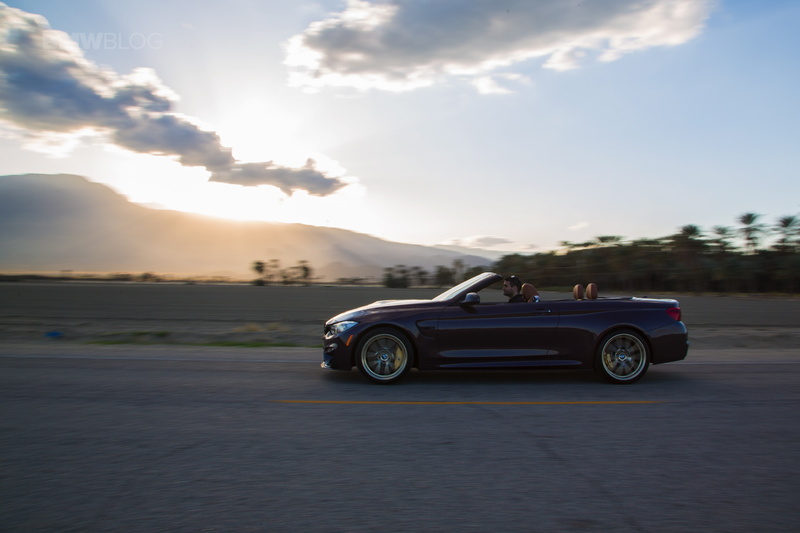 I recently drove the new Audi S5 Cabriolet and it felt leaps and bounds ahead of the M4 ‘Vert, in terms of driver enjoyment, refinement and fun despite being slower, while also costing $10k less. 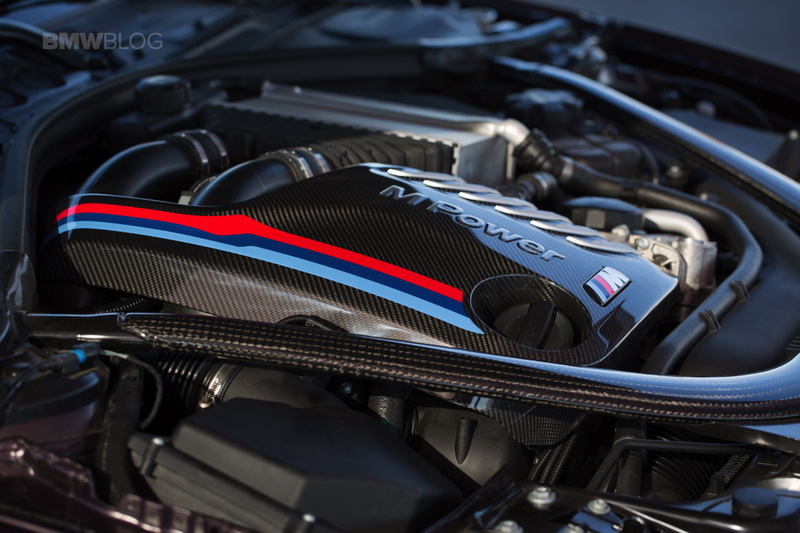 It’s not so much an indictment of the M4 but a sign that BMW has drastically improved since its time. However, having said all of that, it was still an enjoyable car to drive for a week. 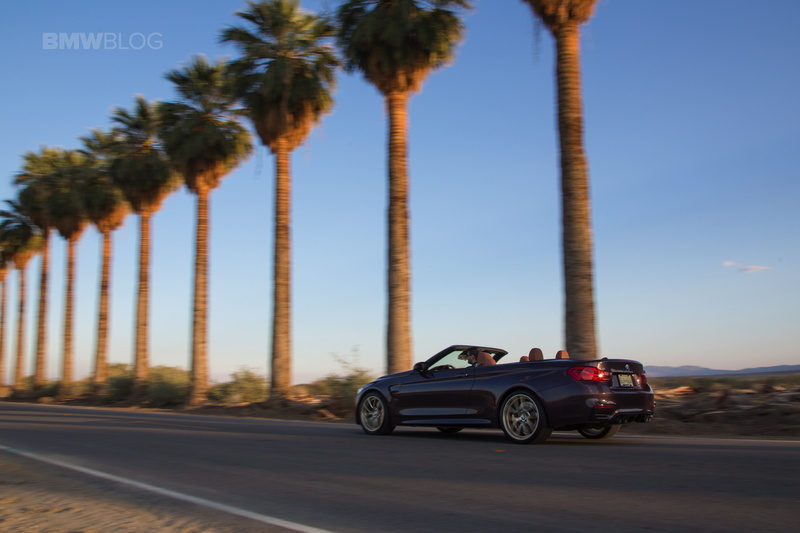 It was a very fast, metallic purple convertible with a six-speed manual. 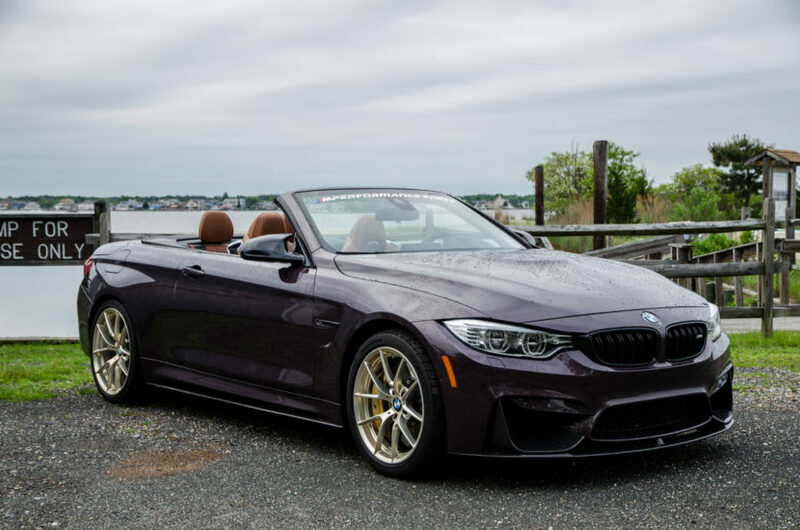 If you’re looking for an M4 Convertible, which I still wouldn’t tell anyone not to, I would say that maybe the M Performance suspension is not needed and, instead, put the money toward the Tourmaline Violet paint and carbon fiber aero kit. 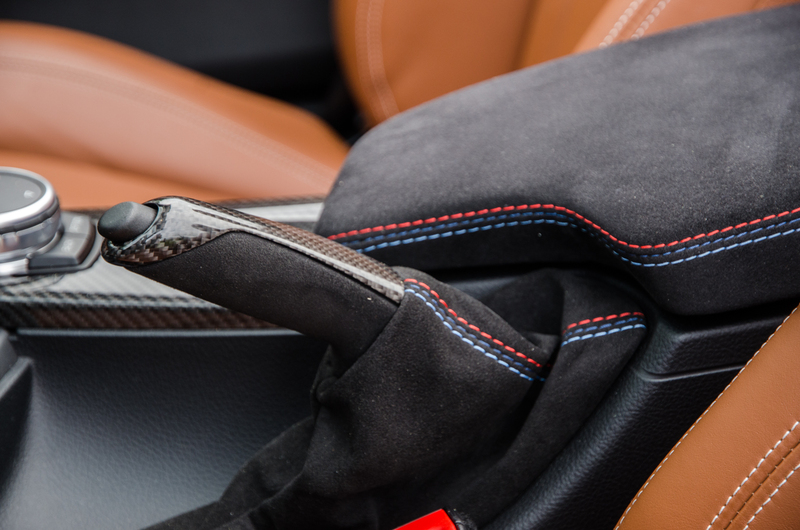 Also, make sure you get the Competition Package, as that sharpens up the steering and suspension without making it stiff. 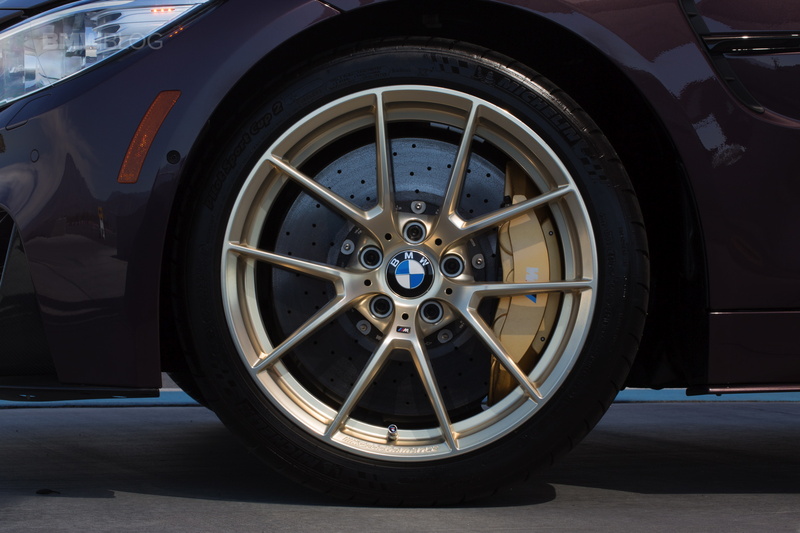 It also sharpens up the rear differential, making it handle more predictably and naturally. 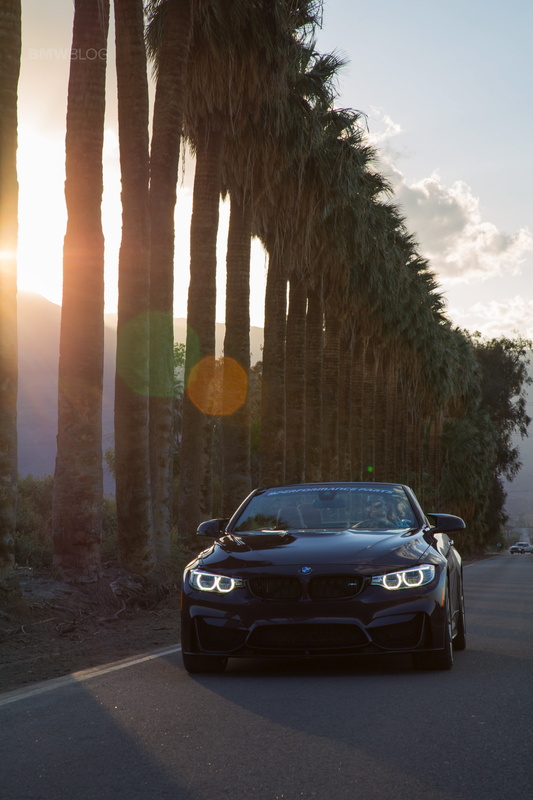 Equipped as such, the M4 Convertible is still a great car to own. And it still looks fantastic.